As traditional retail stores continue to close up shop across the nation, business en masse is moving online. Behemoths like Amazon and eBay are increasingly taking the place of Kmarts and Macy’s that we’re used to. Even large retailers like Walmart are ​investing heavily​ in their online presence to compete with the major shift. But large brands like this aren’t the only ones fueling retails’ digital frontier. Direct-to-consumer brands are also a major part of the online retail market. Brands that handle most all aspects of production, all the way to delivery, are giving consumers a new retail experience, one that caters to both the expediency of online shopping and the personalization of in-store commerce. These brands are cutting out middlemen and selling directly to their customers to ensure that they determine the experience a customer is given. 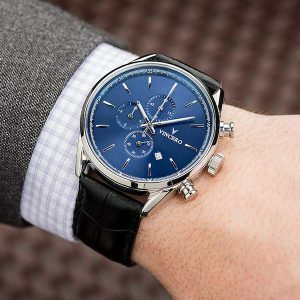 One brand of interest is ​Vincero Watches​, a San Diego startup watch manufacturer that delivers luxury quality watches at an accessible price point. Hailing from the Pacific Northwest, their three founders — Tim Nybo, Sean Agatep, and Aaron Hallerman — spent four years in China after graduating from Gonzaga. They learned the ins and outs of manufacturing and brought that knowledge back to the states to build Vincero. We had a chance to sit down with Tim and get his thoughts on how the direct-to-consumer business model is changing the retail game. What does the term direct-to-consumer mean to Vincero? Direct-to-consumer has been regrettably conflated with cost-cutting, removing the middleman, and a variety of other marketing buzzwords. Being a D2C brand means a lot more than that. We’re trying to find new ways to add value to our customers across all aspects of the business. That isn’t just about cutting out the middleman, it’s about how you look at the business. We look at our business with a customer-centric mindset. D2C means finding out how we can incorporate the customer in every aspect of the business—that’s our why. We want them to feel that they’re a part of our brand, not just a consumer of it. That means crowdsourcing customer feedback to develop new designs, delivering direct to the end-user to provide added value, and an in-house customer service team that prevents problems instead of waiting for them to happen. What value do you get to add to your customers as a direct to consumer brand? feedback helped drive us forward, giving us guidance on what products to create. It helped us build our brand to where it’s at now. Marketing is an equally important aspect of our brand, one that we want to make authentic and valuable for our customers and potential customers. We use channels to communicate with our audience where we believe we can show the personality of our brand. Traditional brands that sell through distributors have a much more difficult time of establishing communication with their end customers. Since that’s a benefit we have access to, we do what we can to foster the relationship. We want our following to be as authentic as the message we’re communicating since that’s where you grow. For us, it doesn’t just stop there. Our customer service is where we try to go above and beyond. Customers have expectations and those are in large part set by the service they receive from other brands. We really believe that brands at large are trying to create the best customer service model possible, so instead of following along, we want to help set the path. Our customer support team is designed to identify problems before they happen. We have a quality assurance team checking products before they go out so we have fewer complaints coming back in. How are D2C businesses reshaping the way consumers interact with brands? I think a lot of this stems back to what I mentioned about customer service: expectations are rising because other companies are raising the bar. You can take Amazon as an example in comparison to other distributors. Department stores like Sears and Macy’s have no doubt been struggling as of late. Nothing changed about them which is inherently the problem. Amazon took the customer experience a step further. They actually took it quite a few steps further. Operating on a digital platform, they obviously can’t offer the same in-person experience, so they made up for that with quick browsing across their entire product selection, product recommendations based on your other purchases, and lightning-fast shipping options for their Prime members. They provided customers with a vastly different experience which made them realize this is the new standard they should expect of distributors. That left others like Sears far behind because they hadn’t changed. This is the same thing that’s happening with brands. A lot of D2C brands are setting expectations and other brands — even some D2C brands — are not fully catching on yet. We’re striving to be at the front of the pack. We’re constantly seeking feedback from our customers to help guide where we set the bar and what we do to make the experience better for them across all aspects of the business. At the end of the day, we should be one of the brands pushing D2C forward. How do the D2C brands of today compare to larger traditional retailers? This relates back quite a bit to the previous question. D2C brands are reinventing the consumer relationship as we speak. The only difference is the nature of the relationship. Calvin Klein, for example, sells through distributors like Macy’s and other department stores. They sold to those distributors, not to the end user, so the relationships they were building was with those distributors. D2C brands have the ability to connect with their customers along every aspect of their business. This gives them a chance to reinvent the game and create a level of customer involvement that has never been seen before in growing a lifestyle brand. This is why the standards of D2C companies are so important. We want to share our brand with our customers and we do that by trying to include them in every aspect of our business. We’re doing our best to invent the standards that brands are held to in order to improve the end experience for consumers.